With just one conference game left this season, the Sonora Broncos are ready to make a run in the playoffs. But first they will host the Brady Bulldogs this Friday, November 9, 2018, at Bronco Stadium. Friday is also senior night in Sonora. Sonora is now 4-5 overall and 2-2 in District 13 Class 3A-II Region IV also defeated Comfort 29-9. Brady now 2-7 overall and 1-3 in district also beat Comfort 35-20 but lost to Johnson City 48-23. Head Coach Jeff Cordell said despite a few hiccups this season, the Broncos are exactly where they want to be and he is confident that they will be successful in the upcoming weeks. The Broncos will be ready for the Bulldogs Friday and whatever follows. 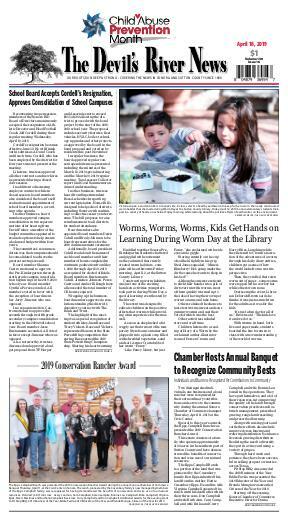 “I am extremely excited for the kids and the community,” Cordell said. Seniors will be recognized before the start of the game. Kickoff is set for 7:30 p.m.
Everyone is encouraged to come out and cheer for the Broncos. 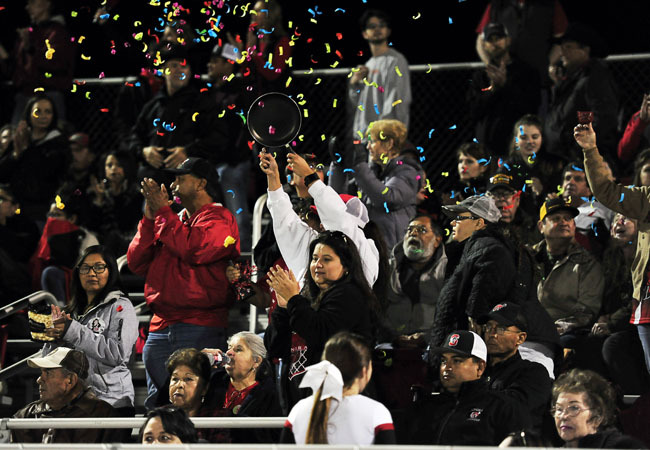 The Sonora Broncos ensured a spot in the playoffs with their conference game victory over the Johnson City Eagles Friday night, November 2, at Eagles Stadium. The Broncos varsity football team defeated the Johnson City squad with a final score of 24-7. A prominent display of Bronco Nation red blanketed the visitor’s side of the stadium as fans cheered on the players. Head Coach Jeff Cordell said the win means the Broncos are in the playoffs and they have proven, once again, their resilience to the adversity that comes with the season. After what looked like a promising start this year, Sonora fell into a five-game skid, but rebound with a district game win over Comfort and now Johnson City to secure a spot in the playoffs. It’s not the road that we had imagined when the season began but we’re back on the road,” Cordell said. “We took a little detour for a little bit longer than we wanted to, but week in and week out we continue to tell our kids to continue to trust the process, continue to believe in one another. 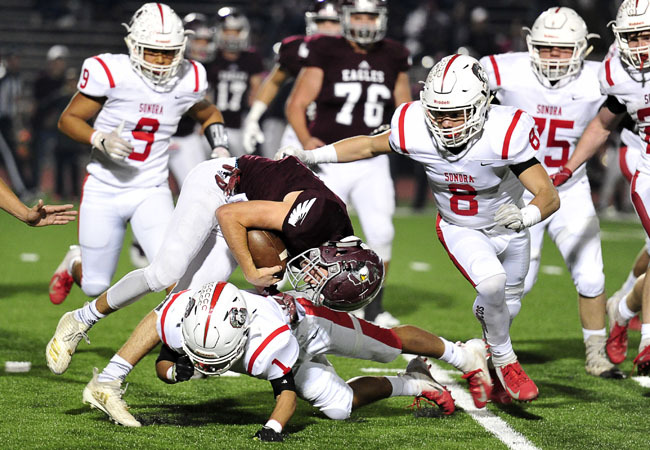 Despite talk among critics before the game, Cordell said both football squads came out to Friday’s game hoping for the opportunity to advance into the Texas High School State Playoffs. Sonora didn’t complete a single pass Friday night, but rushed for 300 yards to clinch a playoff spot against Johnson City. Senior Wesley Dutton, receiver-turned-quarterback, rushed for 154 yards and two touchdowns on 18 carries to lead the way. Wilson Johnson added 61 rushing yards and a TD on 14 carries. Johnson City’s only score came on a fumble return for a TD by Logan Ledger. Johnson City is led by former Sonora coach David T. Sine. His son, Walker, completed 13 of 23 passes ,but was only able to generate 92 yards through the air. The modified offense seems to be working for the Broncos. They have made changes that give them the best chance at being successful, Cordell added. Defensively the Broncos didn’t give up any points to help guarantee Friday’s win for the Broncos. Senior Wesley Dutton said it meant a lot to him and his teammates to win the game and get into the playoffs. “There has just been a lot of hype on this game and we just wanted to get the win,” Dutton Said. The Broncos worked hard to prepare for the match up. Many of this year’s varsity players also played under Eagles Head Coach David T. Sine before he left Sonora in 2017. That coupled with the challenges faced by the Broncos this season and their desire to get into the playoffs added to the must win. Although the Broncos didn’t have the production offensively in the second half that they wanted, they maintained their lead and ultimately achieved the win. The Broncos came out strong and Johnson quickly found paydirt at the 7:22 mark in the he first quarter to put Sonora on the board. Brandon Martinez was quick to follow with a TD and just 19 seconds left in the first stanza. Within minutes of opening the second quarter, Dutton dashed down field to take one home for the Broncos notching the score to 18-0. Ledger put the Eagles on the score board when he crossed the end zone at the 5:12 mark. Dutton ensured the lead with another TD a minute eight before the half. The score remained 24-7 until the clock expired at the end of the fourth quarter and the Broncos left with their win over Johnson City. Putting it all into perspective Cordell said, “People want to make it bigger than it is. It’s a game of football between two quality ball clubs and fortunately we were able to come out with the victory tonight. “That’s what we wanted when we came over here to Johnson City,” Cordell said. Sonora, now 4-5 overall, 2-2 in District 13-3A Division II, will host Brady, 2-7 overall and 1-3, Friday night, November 9, in Sonora.